The Atari VCS and 2600 was one of the most popular home consoles ever produced. First released in 1978 it is also one of the first. There are at least 800 games available many of which were simpler versions of popular arcade games such Pac-Man, Space Invaders and Defender. The Original model has woodgrain and black plastic case. Six silver switches across the upper front panel. Bundled accessories include two CX40 joysticks, one CX30 paddle controller, AC adapter, TV switch and a CX2601 Combat game cart. Same as above except some external cosmetic differences (the "difficulty" switches are labeled "skill level", switch panel is silver instead of black, woodgrain pattern is slightly different. Also Labled Sears Telegames. Entirely new model of the 2600, Black wedge-shaped enclosure, with push button switches and LEDs on top panel. Internally very different from other 2600 models, but still uses the same basic chipset. A white version of the Atari Jr.
Games came in cardboard boxes with the cart held in place with a card inset. 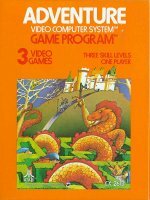 Atari Adventure shown. Atari Video Touch Pad for Star Raiders. The Paddle controller allowed for different gameplay in games such as breakout. Two paddles connected to one connector to allow up to 4 to be plugged in. 'Driving paddles' (pictured) were required for some games such as Indy 500. The standard Atari CX40 Joystick, part of the Atari's success must be attributed to the joystick design which was very sturdy and well suited to playing games such as Pac-man.